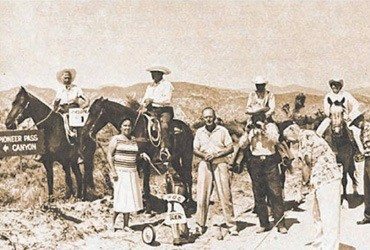 Pioneer Pass Sets 4th Annual Pioneer Pass Golf Event in Oct.
YUCCA VALLEY – Roger Lenhardt, President of the Pioneer Pass Golf Challenge, announced details of the fourth annual event for next October. Another challenge will be to California State trophy competition with special lights representing cities throughout California. There will be a flight for all players with categories for duffers as well as more advanced amateurs. A special woman’s flight is being planned. 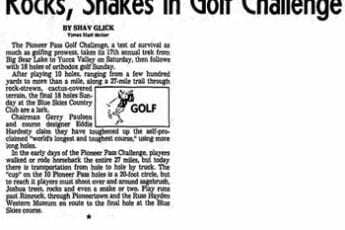 Also to tell the Pioneer Pass Golf Challenge story to the world will be a PPGC pectoral to be published this year. The pictorial will carry mountains and Hi-Desert pictures of the first three yearly events as well as resort and recreation booster advertising in the Hi-Desert and Bear Valley. Coordinating the picked oral will be Harold Van Nest, Alan Fisher, and Art Acason. It is expected that the pictorial will be completed and ready for distribution by Yucca Valley is grubstake days in June sales representative for the pictorial will be appointed soon. “Enthusiasm is high in the mountains,” Lehnhardt reported. 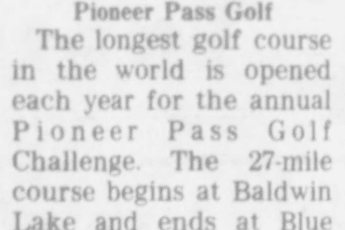 “with plenty of snow expected at ski resorts this winter and with PPGC publicity in Life magazine last fall, the mountain man believe the fourth annual Pioneer Pass Golf Challenge will warrant and get national and international publicity,” he added. On Jan. 31, the board of directors of PPGC will meet at the Yucca Valley Country Club coffee shop.